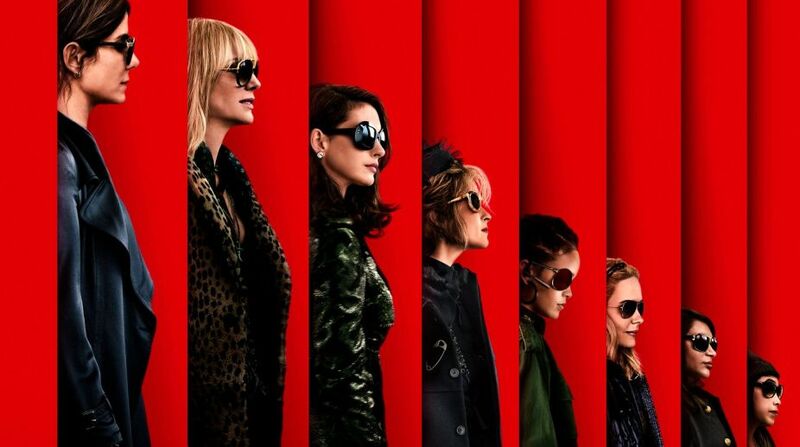 Ocean’s 8 the fourth instalment of the franchise is a spin-off, of Director Steven Soderbergh’s triology – (Ocean’s 11 released in 2001, Ocean’s 12 released in 2004 and Ocean’s 13 released in 2007) which was originally inspired by the 1960 Rat Pack film, Ocean’s 11 starring Frank Sinatra. Spin-off, because unlike the earlier editions, this one is helmed by a mostly female cast that finds its rhythm early in the narrative and even justifies the absence of a male figure in the group, at least in its first two acts. The best line comes when they say, “for once, we wanna be ignored.” But, despite this, those familiar with the series would be disappointed with this edition which is directed by Gary Ross. The film lacks freshness, the chutzpah or the impressive spectacle and the effectiveness of the heist carried out in the previous films. Written by Gary Ross and Olivia Milch, the film never gives its protagonists, among them the legendary Sandra Bullock and Cate Blanchett, a memorable and intimate moment to savour and digest the triumph, but it does offer a display of performances, surprises and shrewdness to achieve the heist. The film begins exactly from where its trailers lead us. After serving a sentence of more than five years, Debbie (Sandra Bullock), sister of Danny Ocean the mastermind in the trilogy, is determined to return to life of thefts and deceptions that put her behind bars. The five years were enough for her to devise a perfect and fool-proof plan. She re-teams up with her former partner-in-crime Lou (Cate Blanchett), who now devotes herself to “getting drunk” with vodka diluted with water. Lou’s current “business plan” provides enough for a quiet life, but Debbie’s offer is impossible to refuse. While Ocean’s Eleven saw the group steal a casino in the middle of a busy night, Debbie’s plan is to steal the 150 million dollars’ worth diamond necklace worn by the diva Daphne Kluger (Anne Hathaway) at the annual gala of the Metropolitan Museum of Arts in New York. The magic of the film is in its execution and how much this respected group of actors do with the material that has been granted. Unfortunately the film runs out of steam in the first act after we see Debbie develop as an impeccable deception artist worthy to carry the surname Ocean. It is interesting to see her along with Lou garner a decadent fashion designer Rose Weil (Helena Bonham Carter), jewellery expert Amita (Mindy Kaling), computer-hacker Nine Ball (Rihanna), a hustler and sleight-of-hand street artist – Constance (Awkwafina) and a house-wife Tammy (Sarah Paulson). Together they bring an unrivalled energy and delivery that add depth to their characters. However, none of the above five actors, match the personas of Sandra Bullock, Cate Blanchett or Anne Hathaway. While Sandra does look jaded, Hathaway interprets an exaggerated version close to the caricature of herself. What makes the viewing tedious is the pace. Even when the stakes are at their highest, the leads’ delivery is cooler-than-thou, tongue-in-cheek deadpan, accompanied by haughty half-smiles, which get a bit flat, irritating and self-conscious. Overall, Ocean’s 8 is a competent summer film that ends up being a conventional thriller, without anything novel or exciting.